Roasted vegetables are delicious, cheap and a great way to get more of your Five a Day. Roast vegetables somehow taste more exciting that their raw or steamed versions, even with the smallest amount of oil – perhaps the fact that they loose their water content means the vegetables have a more concentrated flavour. They truly are perfect for a number of recipes. Add in a few herbs and spices and the humble vegetable is truly a dish fit for a king! Far too many people see roasted vegetables on a menu or in a restaurant and think they must be a bit too tricky to make at home. The truth is roasted vegetables are the easiest thing to cook – you can barely go wrong with them – and it is a great way to use up vegetables that may otherwise be past their best, although fresh vegetables are even better. 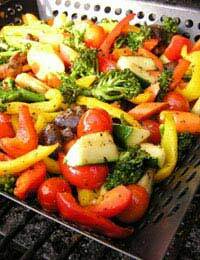 To make roasted vegetables, start by heating your oven to around 180 to 200 degrees Fahrenheit – a pretty high oven. You could also just throw in a tray of vegetables next time you have the oven on for something else. Once cooked, either refrigerate and use them in one of these recipes within the next three days, or freeze them in suitable portion sizes. Take the largest baking tray you have – the one that comes with the oven, as a shelf, is ideal. Roughly chop all the vegetables you want to roast – courgettes, peppers, aubergines, onions and butternut squash all work particularly well and you can add tomatoes if you wish. Make sure the tray is not too crowded or the vegetables will steam rather than roast. Drizzle on a good glug of olive oil and plenty of seasoning. Some basil, oregano or a few chilli flakes is nice, too. Give it all a stir about and put the tray in the oven for at least 30 minutes and up to an hour, depending on how big the chunks are. While you don’t want to vegetables to burn, a little charring round the edges gives a lovely, authentic Mediterranean flavour. Stir them half way too, if you remember. Here are five recipes to make the most of your roasted vegetables. As a meat free alternative, roasted vegetables layered with lasagne sheets and béchamel sauce and topped with grated cheese or torn mozzarella is delicious. Roasted vegetables are wonderful stirred though good pasta, cooked al dente, especially if you cook some tomatoes in with the vegetables. Cook some cous cous in a little chicken or vegetable stock and fluff it up with a fork. Top it with your roasted vegetables, with a little harissa and olive oil dressing and plenty of fresh herbs. You can easily grow potted herbs in your kitchen and they really add some freshness and flavour to your cooking. If you want to add some meat to this dish, a lamb chop or merguez sausage goes really well. Roasted vegetables are the perfect accompaniment to grilled meat and fish – even more delicious with a jacket potato or oven cooked potato wedges. Roasted vegetables do not have to be served hot. If you have a tub of them in your fridge they are the perfect addition to your sandwiches and wraps. The great thing about roasted vegetables is that they add flavour, moisture and vitamins to your lunch. Especially good in seedy bread spread with hummus. Try it! I eat these with a four bean salad, leaves, lemon dressing, pine nuts and cottage cheese - yummy!